Back in 2014, I wrote about six different universities and a community college that were all petitioning the FAA to become exempt from the requirement to hold a ground school certification so that they could participate in the R-ATP program. That post had become somewhat stale, so here is a look back at what happened in the past few years. Chandler-Gilbert Community College was denied its exemption in November 2017 and as of May 2018 was not authorized to certify R-ATP applicants. Metropolitan State University of Denver was denied its exemption in July 2014 and as of May 2018 was not authorized to certify R-ATP applicants. Baylor University was denied its exemption in December 2014 and later gained R-ATP authorization in February 2016. Eastern Michigan University was denied its exemption in August 2015 and later gained R-ATP authorization in July 2016. Jacksonville University formally withdrew its petition for exemption in September 2016 and gained R-ATP authorization later that same month. Auburn University was granted its exemption in November 2015, allowing Part 61 students who graduated between August 2010 and December 2016 to apply for R-ATP. Purdue University was granted its exemption in July 2014, allowing Part 61 students who graduated between January 2009 and December 2016 to apply for R-ATP. Easy-to-read details about the new ATP rules? You found them! I understand the need for simple explanations. There are six ways to get an ATP license now, each with different requirements. This is my summary and comparison of the R-ATP minimums from 14 C.F.R. § 61.159 and § 61.160. The newly-promulgated FAR 61.160 went into effect last week. Already, I am seeing positive changes in the aviation industry. Hiring is on a rapid up-swing, and rumors are starting to circulate about a liberal interpretation of the new first officer qualifications and certification rules. While discussing the potential for a pilot shortage last year, I didn’t yet mention the combined effects of existing trends and the looming 1,500-hour minimum experience level for new first officers. What was happening at the time, and slowly becoming problematic, was that the regional airlines were increasing their own hiring qualifications. Those hiring policies were becoming restrictive faster than the country was producing ATP-qualified pilots. Remember, before the Airline Safety Act of 2010 there was no requirement for regional airlines to hire ATP certified first officers. But the Act required by August 1, 2013 that “all flight crewmembers have obtained an airline transport pilot certificate.” The Act also required the FAA to issue its Final Rule on this by an August 1, 2012 deadline, which it failed to do. This left airlines in the awkward position of hiring only those pilots who could obtain an ATP before the 2013 deadline. Hiring slowed to near zero because there was a shortage of entry-level pilots who could accumulate 1,500 hours of flight experience. The new first officer qualifications are a hot topic. On July 10, the FAA released its Final Rule, which should appear in the Federal Register next week. Everyone has something to say about this. But opinions aside, all I can I find on the web is the text of the new rule and several paraphrased copies of the FAA press release. Let’s take a closer look at what’s inside the 221 pages of the Pilot Certification and Qualification Requirements for Air Carrier Operations. To get the most important information up front here, I compiled a detailed summary of changes as they would apply to a graduate of a qualifying 4-year degree program. I also outlined the structure of the Final Rule and noted the page numbers of some important sections. The small page numbers correspond to the unofficial FAA version, followed in parentheses by the official page number in the Federal Register. For example: Page 1 (42324). This will help you to reference either version of the Final Rule. What are airline pilots really made of? Pilot employment qualifications are changing. For the potential first officer at a regional or major airline, this change will be huge. Currently, the requirements for acting as a first officer or second in command (SIC) of an airliner are simple. All it takes is a commercial pilot license. 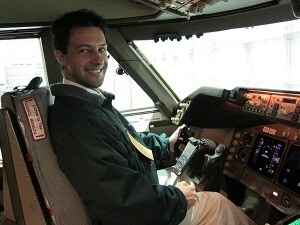 The captain is required to have an airline pilot license, but not the first officer. This is all laid out in the two paragraphs of the applicable regulation number 121.437. A commercial pilot license can be obtained after meeting the minimum 250 hours of flight time experience. Starting on August 1, 2013, the Airline Safety and Federal Aviation Administration Extension Act of 2010 will remove all commercial pilots from domestic, flag, and supplemental operations. By itself, sec. 216(a)(2)(B)(i) of this Act would require “all flight crewmembers” to hold an airline transport pilot (ATP) certificate, which in turn requires at least 1,500 hours of pilot time experience. That’s six times the current requirement to become a first officer.